Introduction Plantar-flexor power below 50 Nm has been shown to be predictive of Achilles tendinopathy in army recruits [Mahieu, 2006]. It appears that muscle weakness may expose the tendon to greater load. As such, eccentric regimes have been proposed as an effective prophylactic intervention [Fredberg, 2008]. 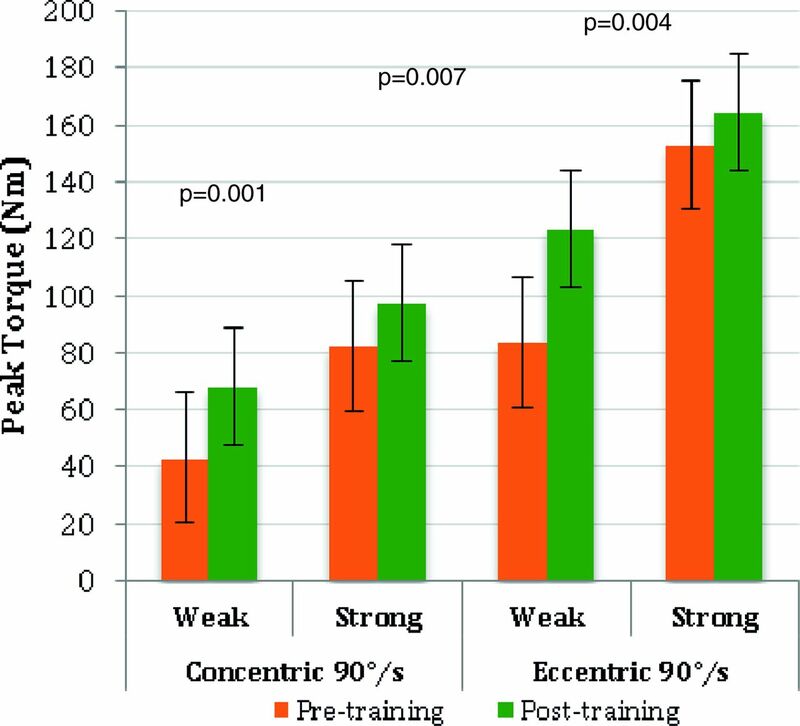 However, little is known about how a typical eccentric regime alters muscle power. Aim – Investigate the effect of eccentric exercise on plantar-flexor power in healthy individuals. Methods A test re-test study was performed with 32 healthy volunteers. Participants were assessed using a Cybex® NORM Isokinetic Dynamometer. They then completed a 12-week eccentric calf exercise programme on one leg and were re-tested [Alfredson, 1998]. The test protocol used speeds of 90°/s concentrically and 90°/s eccentrically, performed with the knee extended. Results were analysed using a paired t test (p < 0.05). Results Significant improvements in plantar-flexor power were seen in the trained leg compared to the untrained leg following the intervention (p = 0.007). The cohort was separated into two groups depending on initial plantar-flexor power measured during the concentric 90°/s phase (Weak: <50 Nm. Strong: >50 Nm). 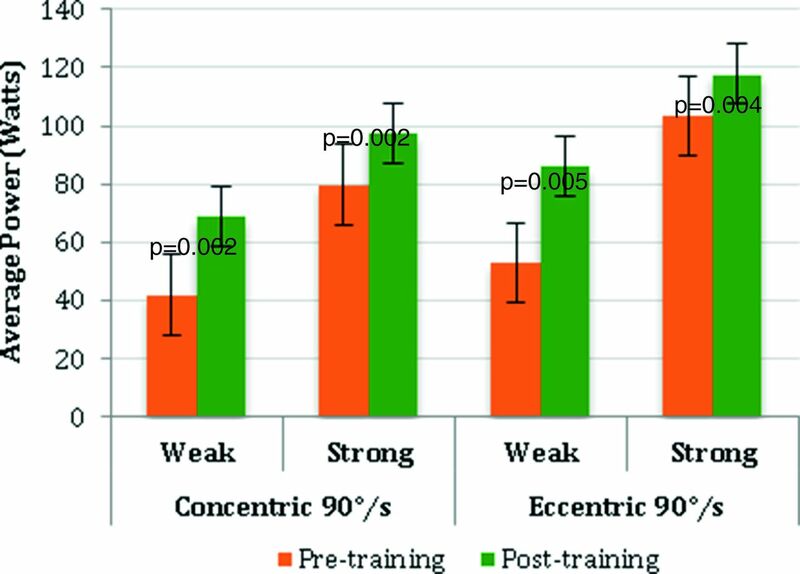 Weak participants improved on average by 58% (p < 0.005) compared to strong participants who improved on average by 16% (p < 0.12, non-significant in eccentric peak torque). Discussion The results show a significant improvement in power after the intervention, with much larger gains in weaker individuals than stronger individuals. Furthermore, strong individuals did not show a significant improvement in the eccentric phase. The finding amongst stronger individuals may result from a failure to apply sufficient additional weight necessary to stimulate neuromuscular adaptation. This could explain why previous research using eccentric loading failed to change the risk of developing Achilles tendinopathy [Fredberg, 2008]. Conclusions Eccentric loading adapts plantar-flexor muscle power, which may provide protection against Achilles tendinopathy.Improvements in plantar-flexor power associated with eccentric training depend on initial power measurements. Individuals able to generate more than 50Nm concentric force, may require additional loading to stimulate neuromuscular adaptations.